Portlanders care about clean air, preventing climate change, preventing deaths, and relieving congestion. Unfortunately, expanding the I-5 Rose Quarter freeway will make pollution worse, won’t help safety, and won’t help with congestion. Here’s the answers to your questions. 1. Why won’t freeway expansion relieve congestion? On “Free Cone Day,” Ben & Jerry’s ice cream shops have lines out the door because they are giving ice cream away for free. Freeways get congested because we give road space away for free. Expanding the freeway to get rid of congestion is like asking other ice cream shops to give away free ice cream to try to relieve the lines at Ben & Jerry’s. The new free ice cream shops will induce more people to show up now that a shop in their neighborhood is offering free ice cream, and new freeway lanes induce more people to drive now that the freeways are offering additional capacity. If you don’t like my ice cream analogy, you can listen to researchers who have studied the phenomenon of “induced demand.” The American Economic Review looked at evidence from US cities and concluded the “Fundamental Law of Road Congestion,” is that increasing roads does not relieve congestion. Local economist Joe Cortright wrote about how induced demand played out in Houston and Louisville, and here it is at work in Los Angeles. 2. Why will congestion pricing relieve congestion? While ice cream lines are linear—each additional person in line only makes the line one person slower—traffic flow is nonlinear—just a few additional cars can cause traffic to suddenly grind to a crawl. Traffic is sort of like a game of jenga: you can keep adding cars and traffic will keep chugging along but one extra car can push the system past a critical tipping point and make everything fall apart for everyone on the road. Once the system tips into congestion, its capacity decreases, meaning fewer vehicles can flow than were able to pass without congestion. The silver lining to traffic flow’s nonlinear nature is that taking just a few cars off the road can disproportionately free up space and shorten travel times for all the other cars. Dissuading a handful of drivers who don’t really need to drive during peak hours, congestion pricing can make the whole system work better and more predictably for everyone. Stockholm, London, Milan, and Singapore have all shown that congestion pricing works in the real world. 3. Will a freeway expansion increase pollution? Some people—including elected officials like Oregon State Senator Lee Beyer and Portland City Commissioner Amanda Fritz—conclude that cars and trucks idling in traffic must be emitting more pollution than they would if they were moving, so expanding the freeway will reduce pollution by restoring free flow of traffic. Unfortunately, that conclusion is wrong. As explained above, a new freeway lane will get traffic flowing in the near term, but the new lanes will quickly attracts more freeway drivers and soon the road will be right back to the same frustrating idle. Only now a whole extra lane of drivers will be idling, meaning more pollution, not less. City Observatory digs into the data here. In addition, highway construction emits between 1,400 and 2,300 tons of CO2 per lane-mile of new highway, so the act of adding two new lanes and shoulders to I-5 will by itself increase climate change pollution. All in all, a 2007 Sightline analysis concluded that over the course of five decades, adding new highway lanes will lead to substantial increases in vehicle travel and CO2 emissions from cars and trucks. 4. Why is ODOT calling the mega freeway expansion a safety project? Because they’re trying to pull one over on Portlanders. Portlanders care about safety, as exemplified by the commitment to Vision Zero—a move toward zero traffic-related fatalities in the next ten years. Portlanders are not so keen on advantaging car drivers above other Portlanders, as exemplified by a history of killing big road projects. Oregon Department of Transportation (ODOT) got the memo and is trying to sell a mega freeway expansion project as a safety project, claiming the purpose of the Rose Quarter expansion is to “improve safety and operations on I-5.” An ODOT spokesman recently told Willamette Week “The primary purpose of this project is to address a critical safety need,” and another ODOT representative pointed out there have been two fatalities on that stretch of freeway. But the proposed project has exactly zero relationship to those two fatalities. They were both homeless men—one may have had serious mental health issues and the other was intoxicated—who walked out onto the freeway. Adding more freeway lanes would not prevent those deaths. The I-5 Rose Quarter Expansion is not a project to help keep Portlanders safe, it is a mega freeway project which futilely tries to make cars go faster. If ODOT wanted to prioritize safety, it could use $450 million to fund Portland’s entire Vision Zero action plan about ten times over. Portland has used a data-driven approach to identify high crash corridors and intersections where many people have been injured or killed in recent years, identify the causes of those crashes, and design solutions that would prevent injuries and deaths. However, people driving on Portland’s streets continue to injure and kill people walking and biking as Portland works to implement its vision. Or if ODOT wanted to protect people experiencing homelessness, $450 million could get hundreds of people off the street and into housing. 5. Is the current freeway situation equitable? Using taxpayer’s money to give out road space for free is not equitable. It gives a big handout to drivers, who, in Portland as elsewhere in the United States, are wealthier than people who take the bus or walk or bike to work or who don’t work. Even when roads are supposedly free, you have to pay an average of $8,558 per year to own and operate a car. For 20 percent of Portlanders, that would mean spending more than one third of their household income on one car. Given this, it is not surprising that people who pay to drive make more money than those who don’t. Freeways benefit (generally wealthier) drivers and don’t benefit (generally less wealthy) people who don’t drive. Free road capacity also encourages sprawl, which can lock middle and working class families into expensive commutes. The “drive ‘til you qualify” approach to homebuying forces families to move further away from their job to be able to afford a mortgage, but in a location where they can’t get to work with the more affordable options of walking, biking, or transit. Finally, highways are often located in lower-income neighborhoods where their pollution and noise disproportionately impacts lower-income people, while their free capacity disproportionately benefits higher-income people who drive. No, the current freeway situation is not equitable. 6. Is a freeway expansion equitable? Spending nearly half a billion dollars on a freeway expansion in Portland will just double down on the inequity of the current system. ODOT’s generous estimates, which assume cars drive faster than the legal speed limit, suggest the expansion could save peak-hour commuters 6.5 minutes during the morning commute and 8 minutes in the evening. (ODOT’s time savings estimates don’t acknowledge the well-documented effects of induced demand, which will generate more traffic and erase theoretical time savings). We’ve already seen that drivers on average make more money than non-drivers, but drilling down further we see that peak-hour drivers make more money than non-peak-hour drivers. In fact, one study showed that just 3 percent of Portland’s peak-hour single occupant car drivers are people with low incomes. Peak-hour drivers impose the greatest cost on the transportation system. Charging all taxpayers to expand the freeway then letting peak drivers use it for free is not fair. Not only is it not equitable, it is not an efficient use of scarce dollars since investments in helping people move via transit, walking, and biking get more bang for the buck. Those who claim or imply Portland should proceed with the freeway expansion because congestion pricing could be inequitable either haven’t thought through the equity implications of the options, or are disingenuously using the poor as an excuse to perpetuate a system which hurts the poor. It is appropriate to worry that priced roads might harm the poor while helping the rich. But we should also worry that free roads do the same, and think about which form of unfairness we are best able to mitigate. People who worry about harms to the poor when roads are priced, and not when roads are free, may be worried more about the prices than the poor. 7. Could congestion pricing be equitable? It is true that tolls are regressive—the same toll presents a bigger burden for a lower-income driver than for a wealthier driver. But done right, congestion pricing could put more low-income people in a better position than they are in now. Peak hour pricing asks those who place the greatest burden on the transportation system (those who drive during peak hours). Those drivers mostly also have the greatest ability to pay, to take more responsibility. That is fair. For the 3 percent or so of peak-hour drivers who have low-incomes, an equitable program could exempt them from paying the peak-hour fees. They would be better off with peak pricing because they could get to work faster at no extra cost. 8. Who wants the mega freeway expansion? ODOT, the Port of Portland, the Oregon Trucker’s Association (OTA) and Portland Mayor Ted Wheeler, and possibly the full Portland City Council. 9. Who wants congestion pricing? A large coalition of individuals and organizations, including OPAL Environmental Justice Oregon, Oregon Walks, BerniePDX, the Portland Chapter of the NAACP and others have joined to express concerns about the Rose Quarter Freeway expansion and ask ODOT and local partners to implement congestion pricing before expanding the freeway. Representatives from Neighbors for Clean Air, the Audubon Society, and 350PDX wrote an excellent op-ed here. Portland Mayor Ted Wheeler also supports congestion pricing, but in addition to the freeway expansion project. 10. Does the City of Portland have a say? State law already requires the Oregon Transportation Commission to pursue value pricing, but it also authorizes ODOT to pursue the freeway expansion megaproject. The City of Portland does not have authority over ODOT, but it can exert pressure. The city’s Central City 2035 plan currently includes features that give a blessing to the I-5 expansion project; by removing those or making a statement in favor of implementing congestion pricing first, the city could pressure ODOT in that direction. 11. How can I have a say? If you live in Portland, you can contact the Mayor and other members of the city council. You can also submit comments to the members of the Portland Region Value Pricing Policy Advisory Committee. 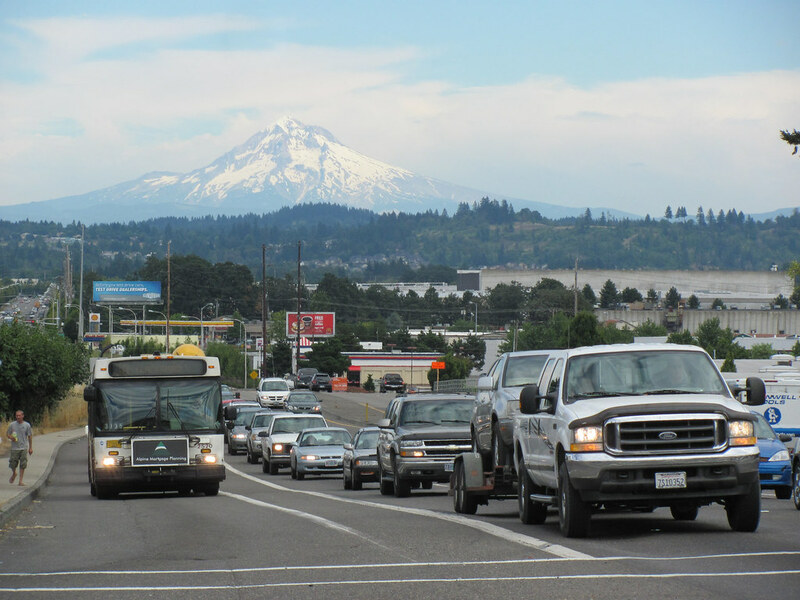 Read: Should Portland Try Congestion Pricing? Previous article in series: « Should Portland Try Congestion Pricing? It would really help if you first described exactly what ODOT plans to do. Saying “freeway expansion” is vague, if not misleading. My understanding is that the plan is to reconfigure two on/off points near the Rose Quarter. And, if I am correct in where those points are, it would be a good idea. My understanding is that there really is no “expansion” in the sense of making another lane that runs the full stretch across the river over to the Rose Quarter area. About 20 minutes ago I posted a civil comment with a question. It’s not here, though…? The main purpose of the exit lanes proposed as part of the RQ project, is to allow people on I-5 to leave the highway and go to the Rose Quarter, more efficiently than they are able to now with the highway’s existing configuration. That’s how it seems to me. During peak use hours, the highway already is packed, bumper to bumper. The exit lanes proposed are fairly long, but not long enough to hold that many vehicles, and at any rate, they would be strictly exit lanes, and not through travel lanes that would add to or increase present congestion levels, longer travel times and so on. Motor vehicle exits onto I-5 from the RQ, by people using the new exit lanes, most likely would be regulated through the use of exit light signals, already familiar devices on many exits onto highways in the area. I have not seen a detail design (I do not think ODOT has completed that work as yet) but hear that the estimated cost is $.5 billion to add a lane in each direction. This is part of the political deal which includes lanes on 205 and 217. I think Ms Eberhard wrote an excellent piece. I think the expensive road expansion has much more to do with employing ODOT and their contractors – doing what they know and always have done. This is an unfortunate waste of a tremendous amount of money and, as pointed out in the piece, self defeating. Darn. The real solution is to stop looking to updated 20th century paradigms. Start planning for incentives for people to transition to computer operated vehicles that don’t require huge buffers between them to operate safely. If people want to get to work fast, they can convert their auto to operate in that environment. Let’s give congestion pricing a try. But we need a NEW I-5 bridge crossing the Columbia. One that uses automated transit to connect Washington commuters to existing Light Rail in Oregon, and accommodates pedestrians and bikes. Autonomous shuttle connects to Oregon’s Light Rail only two miles from Vancouver USA. No rails. No new infrastructure. Built for THIS century. Could it be possible that owning a car enables one to make more money, and not the other way around? The ability to travel farther to work expands one’s employment opportunities greatly, and I don’t think it’s fair to say that a good job gets you a car, rather, in my observations, a car got me a decent job that I couldn’t have had without it. If you know how to maintain your vehicle, you can easily find one on craigslist for under $2,000. Thanks to Barbara L'H. Warden for supporting a sustainable Northwest.